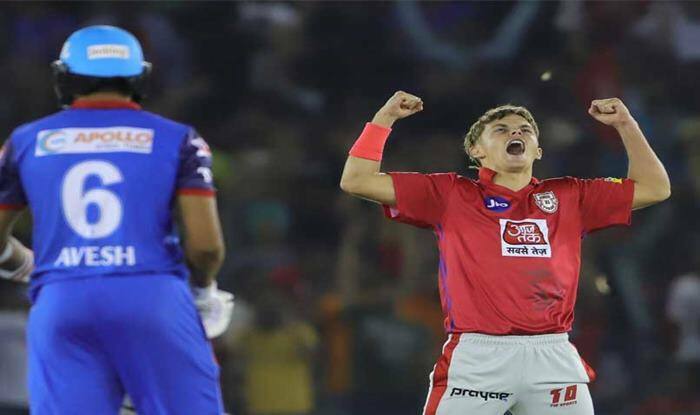 Punjab all-rounder Sam Curran dismissed Harshal Patel, Kagiso Rabada and Sandeep Lamichhane in consecutive deliveries in the IPL match 13 against Delhi to record 18th hat-trick in the tournament's history. However, there were more twists and turns than what Capitals had thought. In a space of 9 deliveries, Capitals lost 4 wickets for only 4 runs. From 144 for 3, they were in a precarious position at 147 for 7. The ball also started reversing more and DC’s lower-middle was incapable of handling the movement in the air. Once Pant was bowled by Mohammed Shami and Chris Morris was needlessly run-out off the very next delivery, things started going downhill. Curran dealt twin blows removing Ingram and Harshal Patel while Hanuma Vihari (2), a surprise selection in this format with a very limited range of strokes was dismissed by Shami as the match swung in KXIP’s favour. Prithvi Shaw couldn’t replicate his performance against KKR but Shikhar Dhawan (30 off 25 balls) and skipper Shreyas Iyer (28 off 22 balls) added 61 for the second wicket to set a platform. Iyer looked a better player of the two on the day with his shot arm pull and the powerful slash over point but played away from his body off a Hardus Viljoen delivery while Dhawan padded a carrom ball from Ashwin. Earlier, Chris Gayle’s absence at the top of the order did have an impact as Kings XI Punjab could only manage a par-score of 166 for 9 after being put into bat. With the ‘Universe Boss’ ruled out due to a back injury (lat strain), KXIP batsmen despite being good at times could never really take the Delhi bowling apart. Save David Miller (43 off 30 balls) and Sarfaraz Khan (39 off 29 balls), other batsmen didn’t have a good day against the trio of Chris Morris *(3/30), Kagiso Rabada (2/32) and young Sandeep Lamichhane (2/27 in 4 overs). Morris was the pick of the bowlers, removing KXIP’s last-match hero KL Rahul (15) with an inswinger as he played across the line. Curran (20, 10 balls) promoted up the order did hit a couple of lusty blows but Lamichhane got him with a flipper. Mayank Agarwal went for a non-existent single and couldn’t beat Shikar Dhawan’s direct throw at the non-striker’s end. Miller and Sarfaraz, however, didn’t get bogged down as they added 62 in 6.4 overs carrying out a recovery process from 58 for three. While Miller attacked Lamichhane hitting him for a six over long-on, Sarfaraz played his now patent “closed eyes scoop shot” over keeper’s head. But Lamicchhane had the last laugh as he edged one to Pant behind the stumps while Miller offer the Capitals skipper an easy skier trying to hit Morris out of the park. In the end, Madeep Singh (29 no off 21 balls) took the team past 160-run mark.